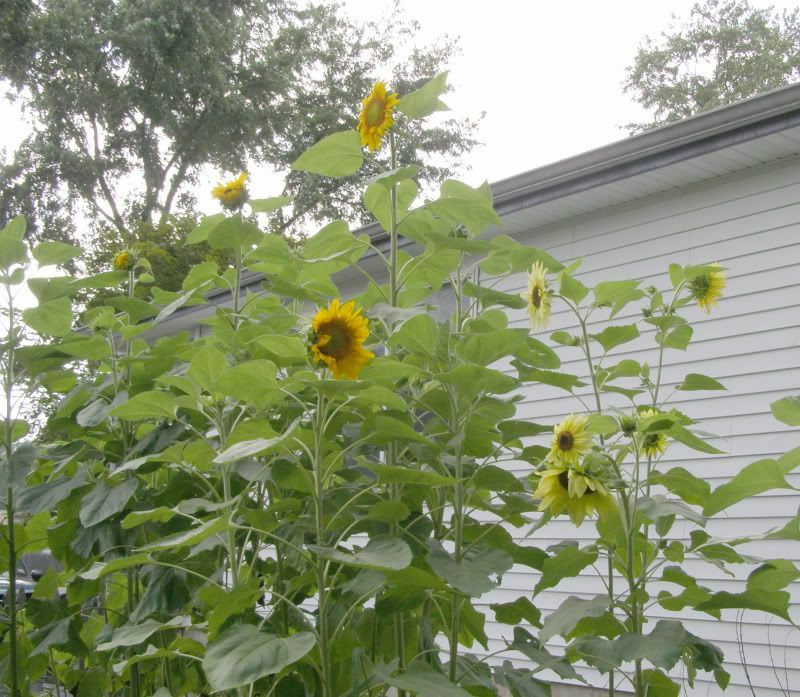 As I may have said before, Sunflowers are one of the cheapest plants you can buy to dramatically change a landscape. Sure they're only annuals but they reseed and occasionally come back the following year. This one pictured above came from a seed mixed into our compost pile. It is easily 13 feet tall. Even when not planted in the right space they do well. This one is a volunteer that came up around our bird feeder. All of the constant foot traffic from the birds and a ground hog occasionally chomping at it has seriously effected it's size. I measured it to be 6 inches, but as you can see it is flowering. It will be luck if it produces more than 5 seeds but flowering all the same. Last year I took the remaining seed head and just tossed them into the compost pile. 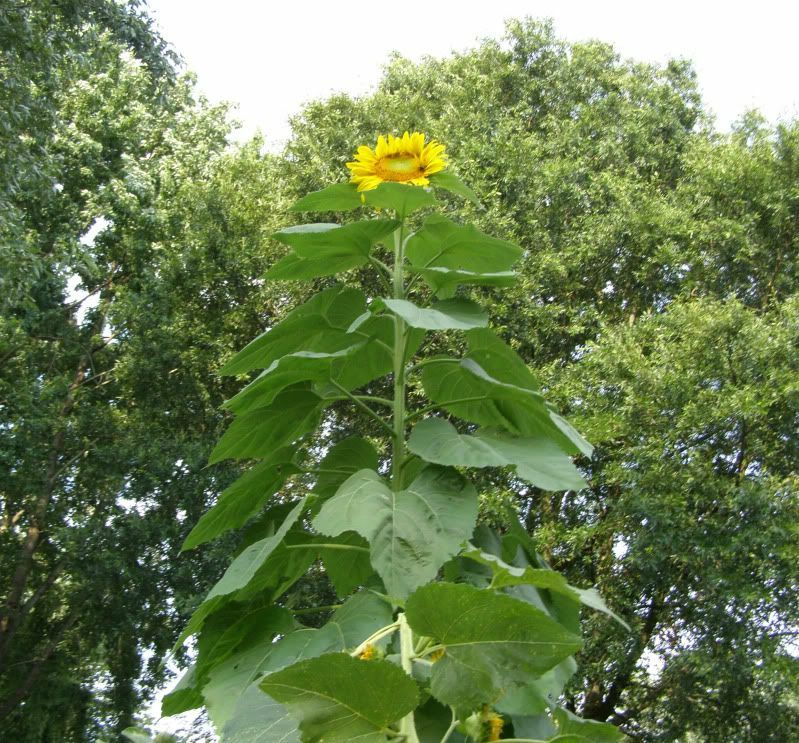 The result was this year I had sunflowers of varying size come up everywhere I spread the compost around. 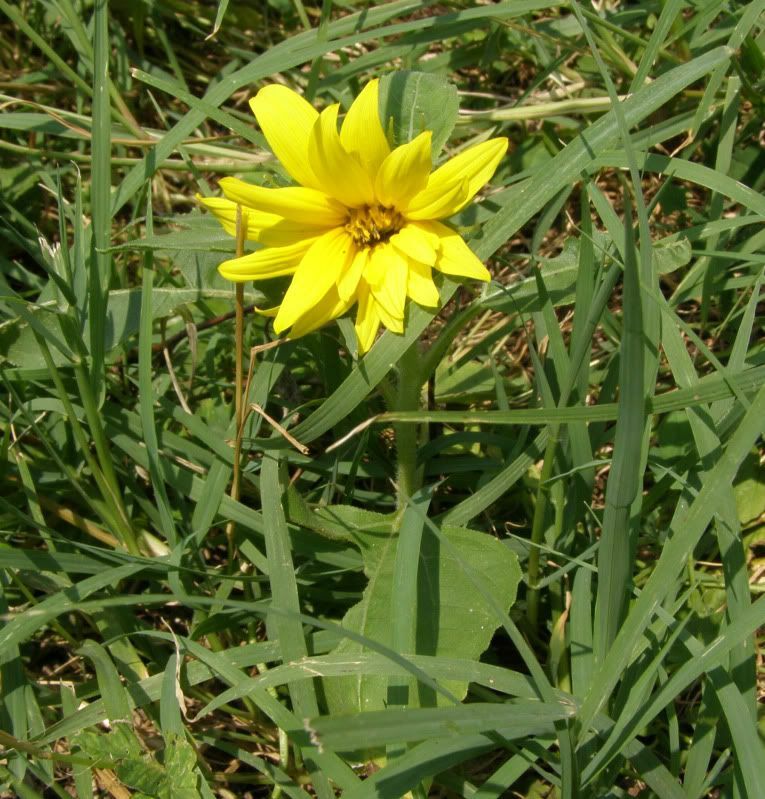 They react well to wintering and tilled soil. Here on the other side of the house are more sunflower. They're about just as tall as the big one from the first photo. Lemon Queen's are on the right side and I use these for The Great Sunflower Project. Photographing the flowers alone though is tricky because they're so pale with dark center. The best I could come up with is to take their picture next to sunflowers that are more yellow. Unfortunately they're not arranged in any well though out way for a good photo. I'll see what I can do next year. Even after they've bloomed they serve a purpose in the garden. 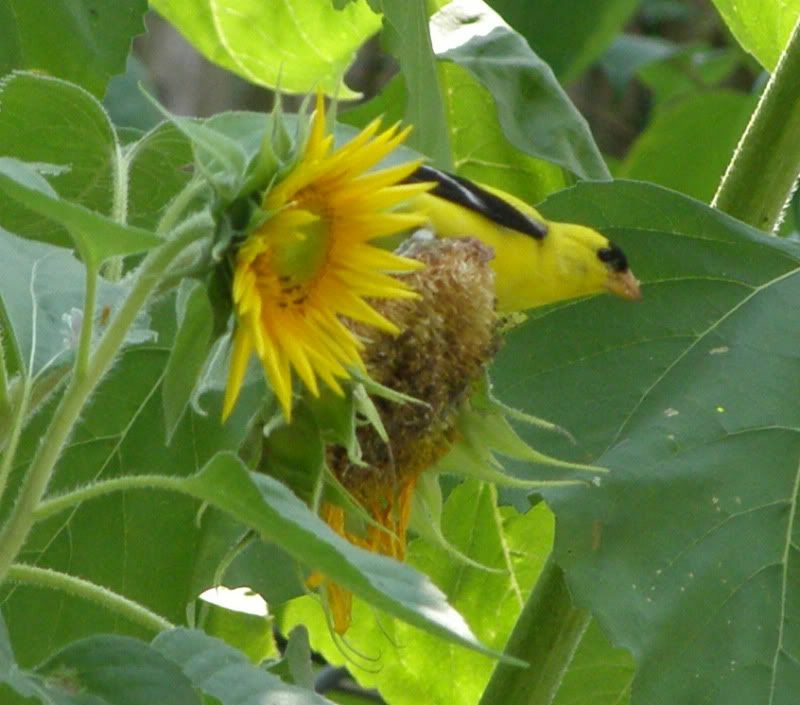 Goldfinches prefer to eat seeds directly from the flower head. 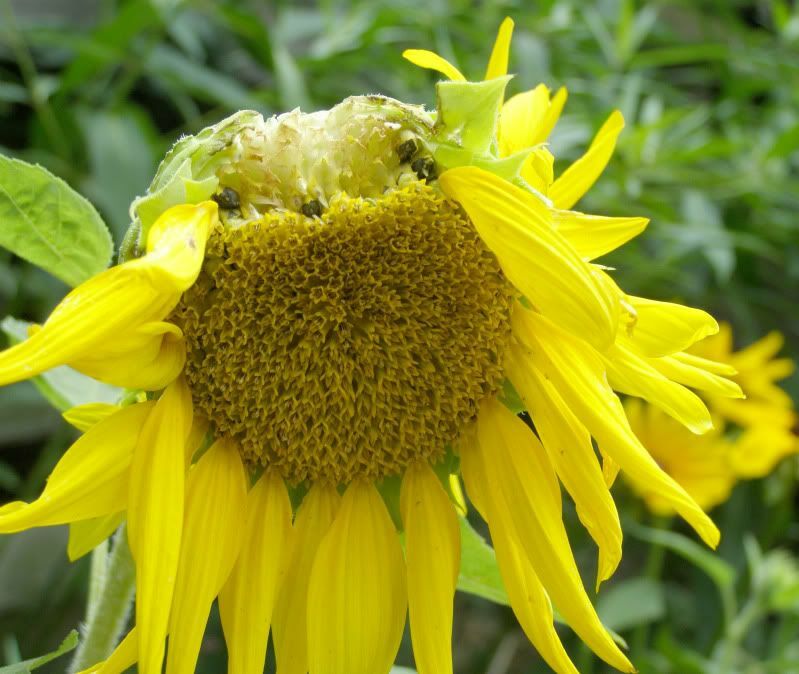 They eat from other plants of course like Liatris, and Coneflowers but Sunflowers are defiantly the main attractor. Balding the sunflowers is certainly something they're good at. Though not pleasing to the eye, it's a clear sign that Goldfinches have been in your garden.